The quadriceps muscle group, located at the front of the thigh, is the largest muscle in the human body. 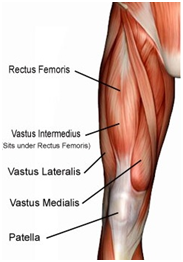 It is composed of four distinct muscles: the rectus femoris muscle, the vastus lateralis muscle, the vastus medialis muscle and the vastus intermedius muscle. The quadriceps are mainly responsible for the movements of extension (i.e. unbending) of the knee and flexion (i.e. bending) of the hip. A muscle strain injury at the quadriceps is caused by an excessif stretching of the muscular fibers beyond their physiological limit. The muscle fibers themselves will for the most part remain intact and therefore the muscle strength isn’t significantly affected. Although there is no complete muscle tear with this injury, a quadriceps muscle mild strain can still be symptomatic. Indeed, one of the most characteristic symptoms of this condition is pain felt with contracting or stretching the muscle, and with palpation over the muscle. There may also be presence of swelling and bruising if the strain was enough to cause a partial tear in some of the muscle fibers.